We have the solution to any and all of your small miscellaneous clutter problems! We offer a number of impressively styled and decorative trinket boxes, all of which are perfect for containing a varying amount of small clutter, ranging from coins to jewelry to itty-bitty trinkets! The trinket boxes here range in style from dragon and fairy to medieval, Celtic, steampunk, and beyond. They all have something in common, and that is that their contained space is perfect for miniscule storage of some sort. Some of the trinket boxes found in this category are elegant little boxes decorated with phenomenal pictures on their tops that just beg to be admired and displayed. Others are clever little combinations of form and function that hide their interiors with an incredibly decorative appearance. Little fairies stand guard over containers of treasure here, just as dragons dutifully watch over whatever hordes you give them. Celtic crosses will hide your secrets, while gothic tombs will keep your items secure from prying eyes. There are literally dozens of trinket boxes waiting to be filled here in this expansive trinket box category. All you have to do is click once and start browsing, and you are bound to find one or more that catches your eye in this impressive variety of fantasy and function. There are times when one trinket box is not enough. 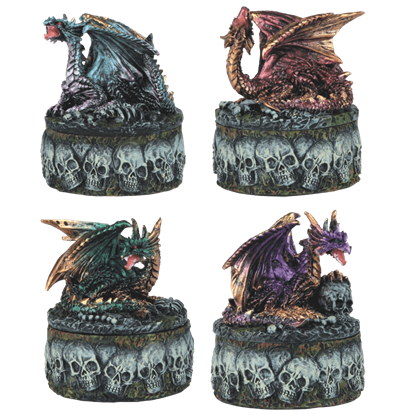 This 4-Piece Dragon and Skull Trinket Box set consists of a series of containers, all of which are perfect for storing away some personal items and enhancing your decor. A forest sprite has built a cottage from an acorn. 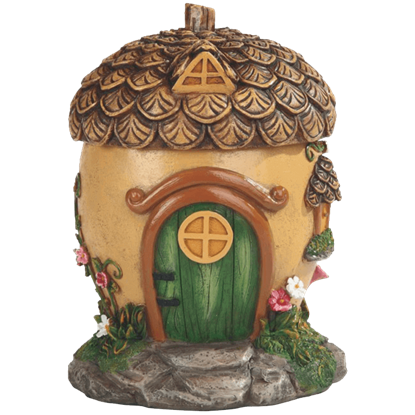 With flowers crawling up the walls and a fieldstone entry, this is a cozy home for one of the wee folk. Lift the acorn cap lid of this trinket box and store your treasures inside. The All-Seeing Dragon Box sees all! But then, that may be because the eyes of this draconic trinket box are movable. They can look at whatever you want! 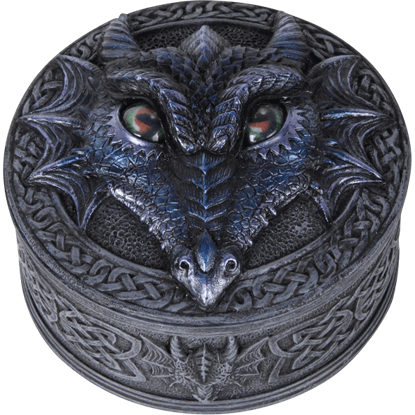 This novelty trinket box features a dragons head surrounded by knotwork. 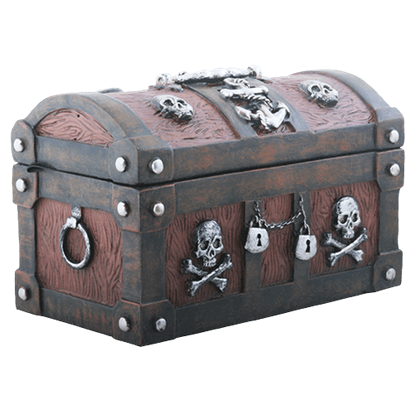 Store all your valuables in proper swashbuckler style with our Anchor and Bones Pirate Trinket Box. Shaped like an antique pirate chest, this box is perfect for holding all manner of coins, jewelry, and other small keepsakes. Grief can be an overpowering emotion in response to the loss of a loved one. 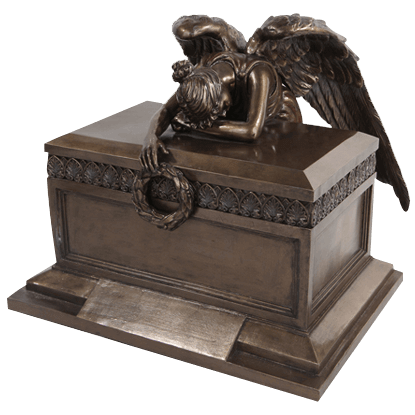 The Angel of Bereavement Urn depicts a sincere expression of sorrow in the form of an angel weeping over a memorial. Dragons fiercely protect what they view as theirs, no matter if it is treasure, territory, or other trinkets. 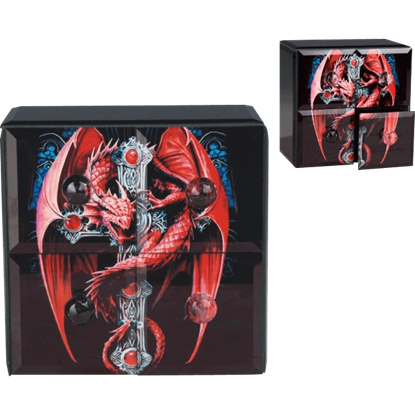 The Anne Stokes Gothic Guardian Chest makes a perfect storage container with its dragon fantasy art keeping watch. Displaying the gorgeous fantasy style of artist Anne Stokes, the Anne Stokes Gothic Guardian Trinket Box displays a detailed graphic over its lid. The image shows a fierce red dragon that has curled itself around a gothic cross. 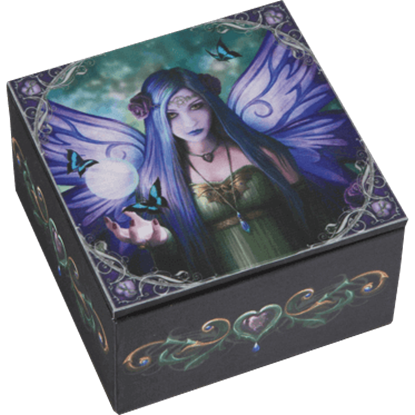 Let magic permeate your surroundings when you add the Anne Stokes Mystic Aura Fairy Box to your home decor. The lid of this fantasy trinket box shows a fairy ready to cast a spell or tell your fate, a magic orb floating at her hand. Dare you gaze into the mystic pool? 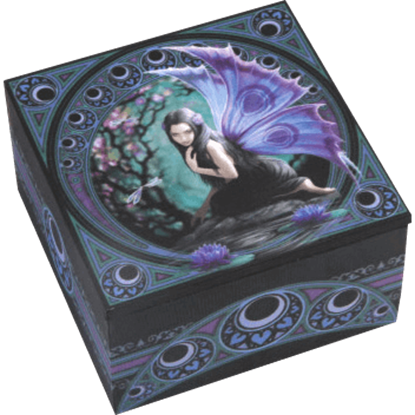 The lid of the Anne Stokes Naiad Fairy Box depicts the fairy guardian of the enchanted waters, a challenging look upon her beautiful face. Elegant art deco circles and swirls surround the scene. 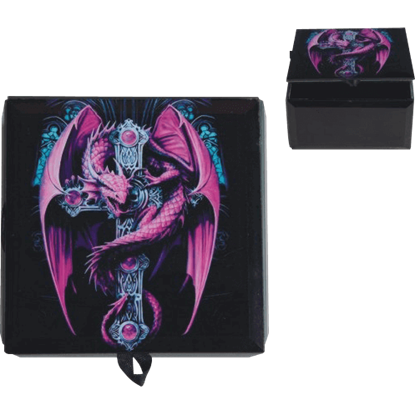 Displaying the gorgeous fantasy style of artist Anne Stokes, the Anne Stokes Purple Gothic Guardian Trinket Box displays a detailed graphic on its lid. The image shows a fierce purple dragon curled around a gothic cross. 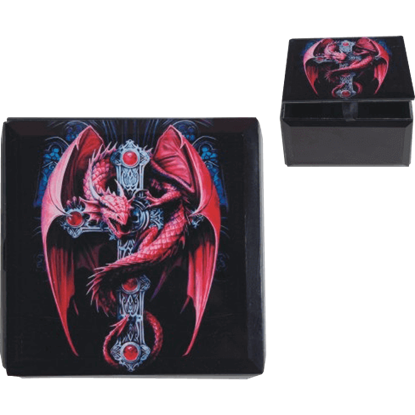 Show off your favorite Anne Stokes piece with the help of this charming dragon keepsake box. 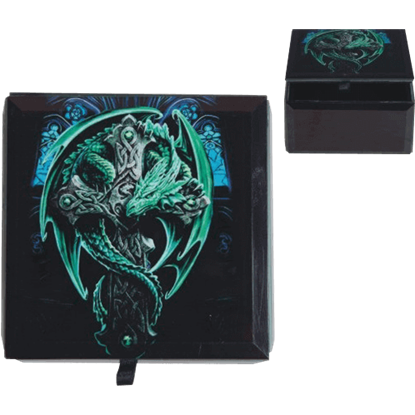 The Anne Stokes Woodland Guardian Trinket Box displays a green dragon that has wrapped itself around a cross decorated with knotwork. The Aquarius Fairy Trinket Box makes the perfect gift for those born under the sign of Aquarius, which runs from January 21 to February 19. 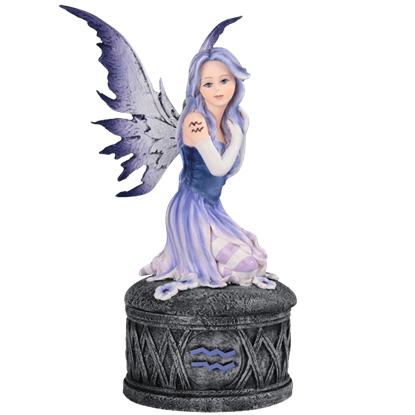 A fairy sits on top of this decorative box, and the base features an Aquarius symbol.